Thank you for choosing Constellation Payments for your EMV terminal needs. Your EMV terminal represents the state of the art in payment processing and data security. In addition to the high level of security that comes standard, this terminal contains proprietary firmware that provides you and your customers an even greater level of protection against data theft. Follow the steps below to authenticate your terminal. You will need to have access to the confirmation email sent to you after your order was placed. The email was sent from noreply@csipay.com with a subject: “your terminal has shipped.” If you did not receive this email, please call the support phone number printed on the sticker that is attached to the terminal. Note: Some magic boxes will have a built in Ethernet cable. 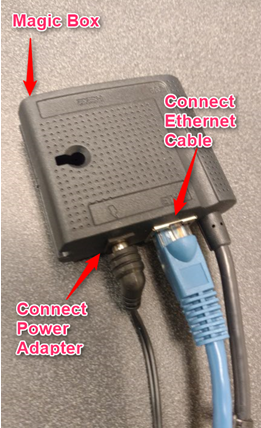 If you have a magic box with a built in Ethernet cable, proceed to step 2. 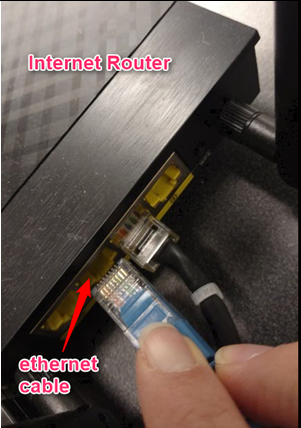 Note: If you do not have direct access to your Internet router, please call the support phone number printed on the sticker that is attached to the terminal for assistance. Enter Activation Code - wait for the terminal to display the activation screen below. Please allow a few minutes for this screen to display. This number can be found in your confirmation email. Follow onscreen prompts until you receive a message on the terminal screen confirming that activation has been successful. Constellation Payments terminals come equipped with our own proprietary application that includes additional security features as well as the ability to remotely update the terminal over the internet. This means that your terminal will become even more secure over time and we will have the ability to push new functionality right to your terminal. Credit or Debit? – Your terminal comes ready to process both credit and PIN debit transactions. Magnetic Stripe Reader – Over 70% of US banks have still not issued chip enable cards. For this reason your terminal comes equipped with a magnetic stripe reader. All cards with magnetic stripes on them can be authorized using this method. EMV Chip Reader – while your EMV terminal is equipped with a chip card reader, it is currently disabled. This functionality will be added in the next few months at which time your terminal will be remotely updated over the internet and you can begin using the EMV chip card slot. Please be reminded that you can process all transactions, including those where a chip is present by swiping the magnetic stripe on the card. We will notify you when this update has occurred so you can inform your staff to begin using this functionality. Contactless Payments - (contactless cards, ApplePay, AndroidPay) – Your terminal is also equipped with hardware to securely read wireless or contactless transactions via cards and smartphones equipped with NFC technology. This functionality will also be enabled via remote terminal update when available.